On Oct 15, 2018 a deranged perv blasted his way into the Closs home in Barron, WI. He killed the parents of Jayme and took her, by force, to a residence about 70 miles north of Barron. 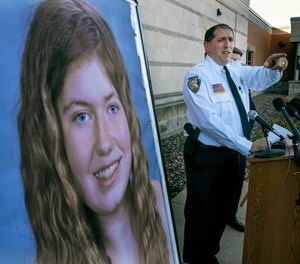 Jayme Closs and Barron County Sheriff Chris Fitzgerald. After being held a total of 88 days, she managed to escape by running to a woman walking her dog. She was immediately recognized and taken to a neighbor’s home, given a blanket and a lot of love until police and fire units arrived. After spending the night in a hospital, she was reunited with family members. A BIG tip o’ the “cop’s perspective” hat to Barron County Sheriff, Chris Fitzgerald, and all the law enforcement agencies, friends and neighbors who didn’t give up hope. And a big hug to Jayme who had the will and cunning to survive what must have been a most unpleasant experience. The future will be tough and challenging for Jayme. With the help and caring of this great community, let’s all hope and pray that she endures and prospers.